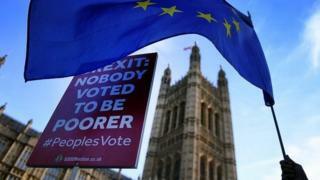 Another Brexit referendum will become a “plausible” way forward if there is deadlock in Parliament, Work and Pensions Secretary Amber Rudd has said. She told ITV’s Peston testify while she did not personally subsidize another poll, the action for one would thrive if MPs could not agree another solution. She said she hoped MPs would back Theresa May’s deal with the EU next month but it would be “very difficult”. The PM says the UK must be ready to leave without a bargain if it is rejected. Mrs May has repeatedly ruled out harbouring another referendum, saying it was the government’s duty to implement the result of the 2016 Brexit vote. A Downing Street source said the government was “very clear we are 100% opposed” to another referendum. The UK is due to leave the EU on 29 March 2019 but an agreement on the terms of its withdrawal and a statement on future relations will simply come into force if the UK and EU Parliaments approve it.